Society is broken. We can design our way to a better one. In our interconnected world, self-interest and social-interest are rapidly becoming indistinguishable. If current negative trajectories remain, including growing climate destabilization, biodiversity loss, and economic inequality, an impending future of ecological collapse and societal destabilization will make "personal success" virtually meaningless. Yet our broken social system incentivizes behavior that will only make our problems worse. If true human rights progress is to be achieved today, it is time we dig deeper-rethinking the very foundation of our social system. 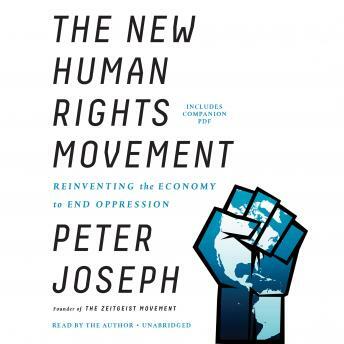 In this engaging, important work, Peter Joseph, founder of the world's largest grassroots social movement-the Zeitgeist Movement-draws from economics, history, philosophy, and modern public-health research to present a bold case for rethinking activism in the twenty-first century. Arguing against the long-standing narrative of universal scarcity and other pervasive myths that defend the current state of affairs, The New Human Rights Movement illuminates the structural causes of poverty, social oppression, and the ongoing degradation of public health, and it ultimately presents the case for an updated economic approach. Joseph explores the potential of this grand shift and how we can design our way to a world where the human family has become truly sustainable. The New Human Rights Movement reveals the critical importance of a unified activism working to overcome the inherent injustice of our system. This book warns against what is in store if we continue to ignore the flaws of our socioeconomic approach, while also revealing the bright and expansive future possible if we succeed.